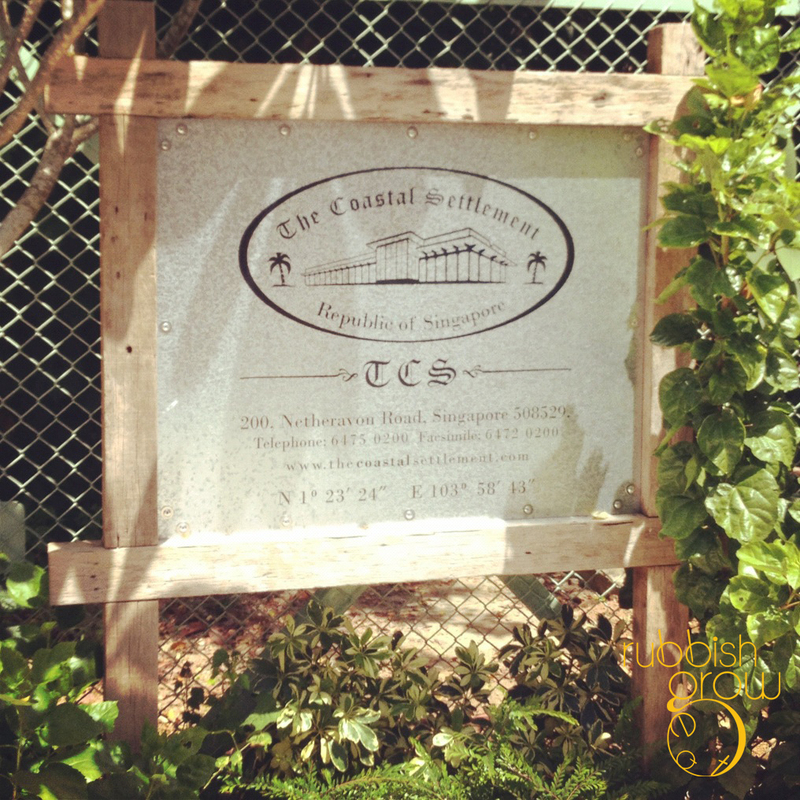 TCS is located in ulu Changi Village. There’s a colorful beetle parked the front porch, it’s very impossible for you to miss it. 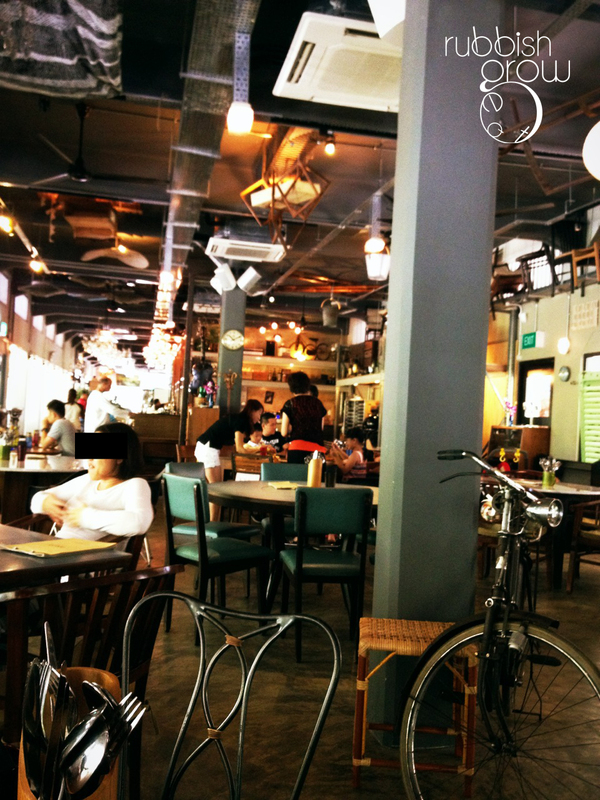 The place is decorated with all the old skool knick-knacks such as a singer sewing machine, vespa & bicycles etc. TCS is huge, possibly even bigger than PS Café at Dempsey. It gives me a very PS Café feel because of the full-length windowpanes. There is a huge alfresco area which is suitable for chilling in the evenings/at night. But their prices are higher than PS Cafe. For people with kids, there’s a playground outside for them to play. There’s a kid’s menu as well. They offer all day breakfast but do not expect egg benedicts, poached eggs or eggs Florentine. They have toasts, bagel & tortilla. 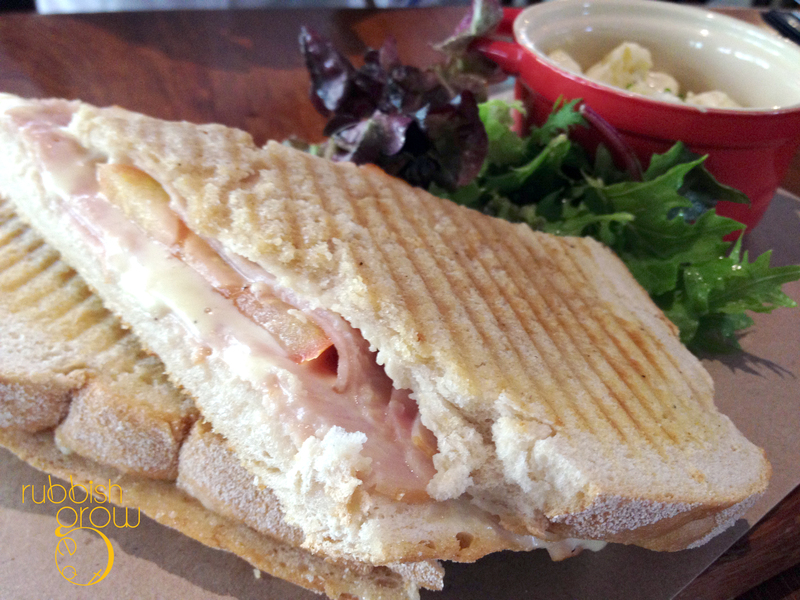 Yandao had Toasties (S$16), which is made of Toast, Honey Baked Ham, Cheddar Cheese, Roma Tomatoes & Potato Salad. It was presented on a chopping board, which I thought was cute. The toast was toasted to perfection and the melted cheese bound all the ingredients together so that it gives you a better oomph when you bite into it. The tomato gave the toast a light feel. A simple, yet satisfying fare which TCS had done with perfection. The potato salad was better than many other potato salads I’ve tasted but the potato salad which I make is definitely awesomer. It was quite a huge portion and Yandao was stuffed after eating half the Toasties. I didn’t feel that the price is justifiable despite the huge portion because it’s just ham and cheese toast. Well, at least we didn’t order the Big Otah Toast ($18). That is super boh hua… I’d make my own Otah Toast tyvm. 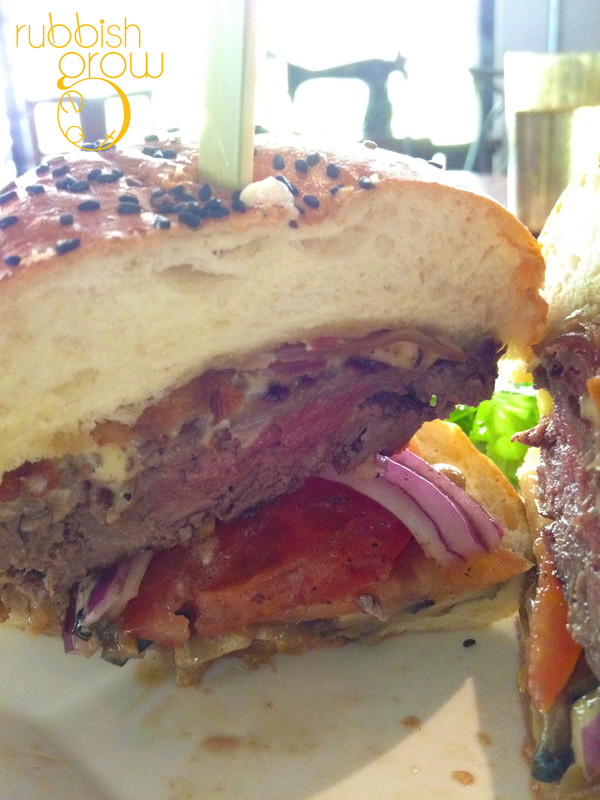 I had Cheese Burger ($26) after visiting their website because the portrait is so tantalizing. 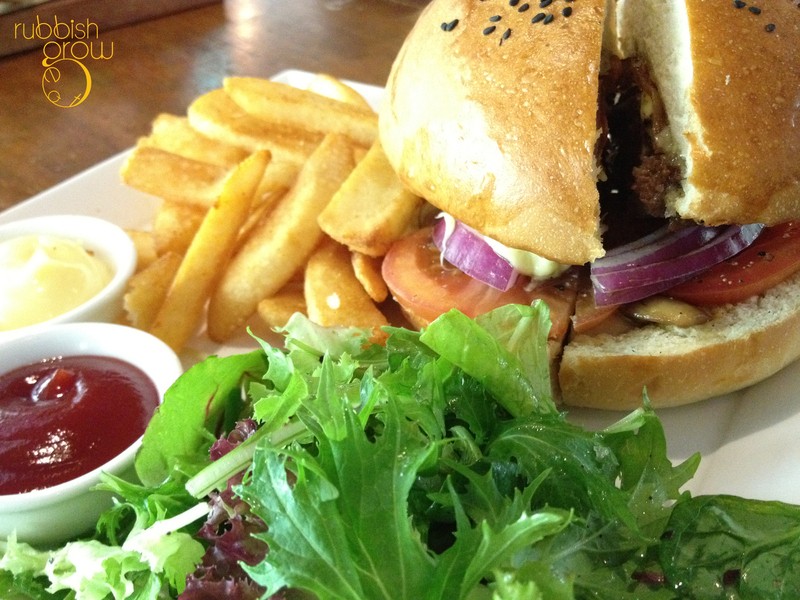 It comes with 180g Wagyu Beef patty, melted smoked cheddar cheese, sliced mushrooms, bacon strips, mesclun salad & fries. You can choose to add a fried egg for $3 which I didn’t cos I was afraid I’d get a heart attack on the spot and the nearest hospital (Changi Hospital) is now defunct. They gave ketchup and hollandaise sauce (not sure about this, but it’s probably hollandaise mix mayonnaise. Yes, can u feel your arteries clogging while reading this?) to complement the burger and fries. The buns were toasted lightly and crispy on the outside, very soft on the inside. And yes, the bun was tall and very substantial and I love the entire presentation of the Cheeseburger. I love how the onions & tomatoes gave the burger a crunch. The patty was nicely grilled, very juicy and tender. However, it had a very strong beef stench which I didn’t quite like. Da bomb was the fries which were similar to Brussel Sprouts fries. If only they were free flow like Brussel Sprouts. Again, serving was humongous and me, being chio & skinny, couldn’t eat it all. We wanted to order desserts but we were too stuffed to eat anything more. We will definitely be back someday with friends to try other stuff on the menu such as Wagyu Cubes ($22), Portobello Fries ($14, Bread Crumbed Portobello Mushrooms with Truffle Mayonaise! ), Truffle Fries ($15, MY FAVOURITE), Good Old Fish & Chips ($26) and their desserts – Waffle ($14! ), Gula Melaka Panna Cotta ($12), Sea Salt Caramel Cheese Cake ($12!) etc. Next time, we are sharing because the food is expensive and portion is huge. They should consider adjusting their prices because this is a very casual place and rent in ulu, inaccessible Changi should be cheap. Then again, if I were a restaurant owner and my restaurant is only accessible by cars, I will charge exorbitant prices since these patrons earn enough to keep a car and are willing to travel to such places for food. Dilemma dilemma dilemma. There is a Kronenbourg promotion at Coastal Settlement. 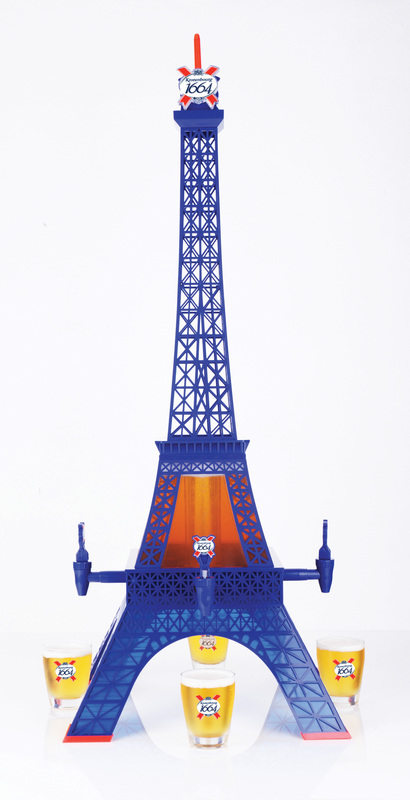 The French lager now comes in an Eiffel Tower. So awesomely pun-ny! My kind of humor. I imagine the tagline to be “Why get a beer tower? Get Beer Eiffel Tower!” An Italian beer is soon to copy this idea and come out with Leaning Tower Beer. Chinese Beer will come out with Pagoda Beer Tower. Two other places that have the beer Eiffel Tower are Bar Bar Black Sheep (Bukit Timah and Robertson Quay branches) and Em by the River. The purchase of the Beer Eiffel Tower at Bar Bar and Em entitles the customer to a pair or two pairs of limited edition iphone casings during happy and non-happy hours respectively. Another way to get the iphone casings is to purchase two packs of 6 bottles from major supermarkets. The promotion takes place from 1 Mar to 30 April, while stocks last. The casing giveaways are part of a promotion for Kronenbourg Signs of Attraction on Facebook. Starting today to 31 May, singles can like the facebook page and join the events and the winning Bachelor and Bachelorette will win a trip to Paris. Did you just change your Header (picture). The crab claw looks amazingly delicious! OMG (hungry)! Haha, I’ve several header pics and they change with every new refresh. Is it the wasabi crab or just a plain super-fresh looking claw? The wasabi crab is from Ellenborough Buffet at Merchant Court and the super-fresh looking one is from Brasserie Les Saveurs at St Regis buffet. Super fresh looking one! omg. I need to print it and put at my work desk as a motivation and inspiration haha. Hahaha, I also want to print the photo and put on my desk for motivation too! It’s $130 without champagne and $180 with champagne. Nope, not much of a beer person. But I did have a strawberry daiquiri and liked it. 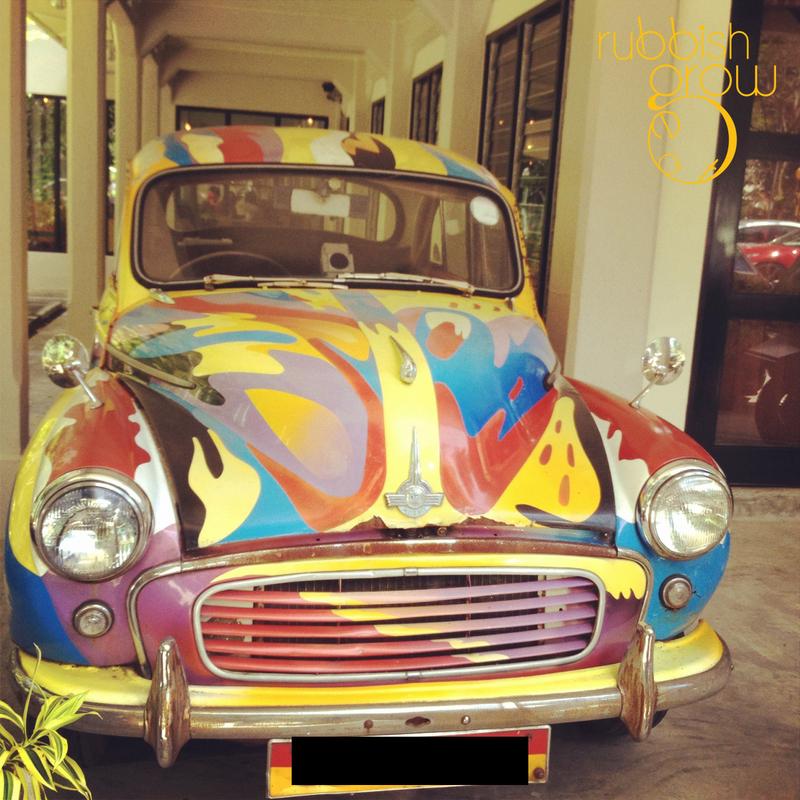 First and foremost, the car parked outside is not a VW Beetle, but an old Morris Minor. Thanks for enlightening us. What’s a Morris? Lol.